Looking for decorating supplies for a project you're about to start? Whether you're refreshing one room or redecorating the whole house as part of a larger renovation project, you'll need to think carefully about what each space will require, decorating-wise, in order to achieve your desired outcome. So, to ensure you're on the right tracks, we've put together a comprehensive list of extension essentials, covering everything you might need for every room and every type of home. As well as ensuring you've covered all bases, our checklist guides you in the right direction when it comes to sourcing expert advice. Don't forget to check out our decorating hub page too, for more expert planning, design and costing advice. Decorating your home's exterior is an easy way to refresh the look of your property as a whole, while adding value and hinting at what's to come on the inside. Plus, it's more affordable than you might have imagined. From refreshing your front door with our pick of the best external paint, to giving your home a whole new lease of life with a new coat of masonry paint, you'll find expert tips as well as our pick of the best sources in this section. We're only covering the aesthetics in this guide, so if you're looking for more comprehensive advice, you may benefit from reading our guide to how to transform your home's exterior. If you're looking for an easy and affordable way to update the look of your home's exterior and add value to your property, it's worth considering painting it. An effective solution, whether you're looking to improve the appearance of ugly or damaged brickwork or dirty pebbledash, there are a range of shades of masonry paint to choose from depending on your desired finish. While white and grey are popular options, mostly on account of their timelessness, it's also possible to choose something a little brighter – especially if you live on the coast. Read our guide to painting your house inside and out for techniques and tips. Dulux Weathershield Masonry Paint is our most highly recommended finish, and we're big fans of Sandtex, too. In addition to improving the aesthetic appeal of your home, regular maintenance of your external woodwork will prevent the need for major repairs or replacement further down the line. This is particularly important in the case of wooden doors and window frames, which are easily damaged by the effects of the cold and damp. In terms of colour schemes, you might keep things classic with black, white or brown. For a cottage or period property muted tones, such as sage green, can be effective, too. Use our handy guides to how to strip paint from a wood door and how to repaint and revive outdoor woodwork for step-by-step instructions for preparing woodwork for decoration. You'll find advice on finding the best paint for wood in our buying guide, though we'd particularly recommend the Cuprinol Garden Shades Natural Stone Matt Wood Paint for painting the garden shed (more on that below). Otherwise, stick to Dulux and Sandtex for quality finishes for exterior wood. If you're decorating the outside of a period property, you may have original iron gates and railings that are in need of a fresh coat of paint (and with that protection from the elements). Similarly, it may be your lead drainpipes that are in need of a refresh. We'd recommend using our guide to how to clean, repair and repaint old iron railings and gates for step-by-step instructions, before beginning painting. Whether separate, or attached to your home, your garage will contribute to the overall appearance of your home's exterior and should be maintained to the same standard as the rest of your property. While most garage doors can be painted on a DIY basis, you may wish to hire a professional decorator if you're short on time or lack the confidence to complete the task. You'll be amazed what a fresh lick of paint can do to refresh the appearance of your home, providing you choose a paint formula and colour that suits the style of your property. For example, if you're working with galvanised steel you'll need to choose a compatible paint. Start by choosing a primer – we'd recommend something like Hammerite Direct to Galvanised Metal Paint which is both a paint and primer in one – and paints that are designed with garage doors (or external wood) in mind. Recommended options include Hammerite’s Garage Door Paint, as well as Dulux Weathershield , which is suitable for both wood and metal surfaces and Bedec Barn Paint, which is also suitable for wood, metal and galvanised doors and comes in a range of finishes such as matt, satin and semi-gloss. Zinsser Allcoat Exterior Satin is another option worth considering. Looking for more advice? Use our guide to how to paint a garage door for more expert information as well as step-by-step instructions. Part of your exterior decorating might also include painting garden furniture or sheds, either to prevent them from damage or to tie together the rest of your scheme. Shades that replicate wood are popular, along with other muted shades. We'd recommend using Cuprinol Garden Shades Natural Stone Matt Wood Paintor the Cuprinol 5 Year Ducksback Silver Copse Matt Shed & Fence Treatment. While our garden furniture and shed paint suggestions are equally apt for fences, you'll save yourself time (and sore wrists) by opting for a paint sprayer, instead. As well as ensuring a consistent finish, most paint sprayers are high volume, low pressure, which means less mess and waste. Browse our pick of the best paint sprayers if you want to ensure you're getting the best model for your needs. Our top picks include the Wagner WallPerfect Flexio Paint Spraying System for large areas, as well as the Bosch PFS 3000-2 All Paint Spray System with its interchangeable nozzles. When it comes to updating your decking, options include paint and stain and oil, with the main difference being that stain and oil will allow you to retain the texture of wood while paint will mean losing (at least some) of the wood effect. When tackling exterior decoration, you might require a selection of power tools to finish your work to a high standard; whether that's a nail gun to make a last minute fix to a loose roof tile, a chainsaw for tackling an overgrown garden or a hammer drill for other 'finishing-off' tasks. Whether you know what power tools you need and are simply looking for tips to ensure you choose the correct models, or have no idea what tools are required to complete your works, our guide to the best power tools every DIYer should have is a handy read. In terms of sourcing power tools, we'd recommend B&Q, Wickes and Homebase as great starting points. 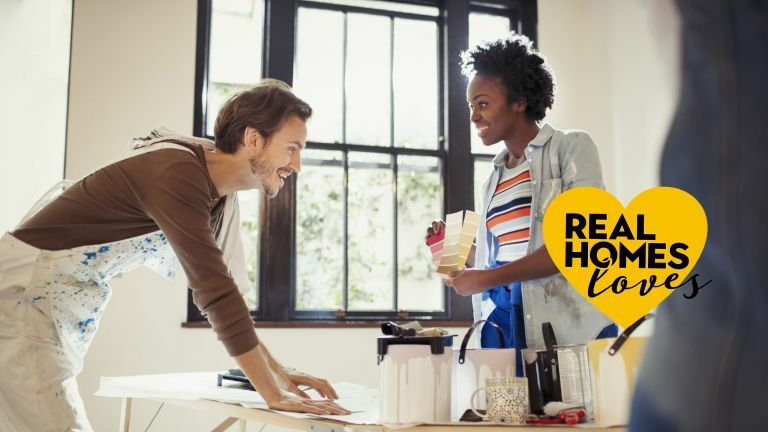 You may have some of these essentials lying around, but if not they can all be picked up relatively inexpensively from some of our favourite DIY superstores, including B&Q, Wickes, Amazon, Tooled Upand UK Tool Centre. When it comes to decorating, failing to prepare really does mean preparing to fail. If you're looking to achieve a smart and professional looking finish on a DIY basis, it is essential that you take time to plan your project properly and effectively prepare the space for decoration. This section is designed to ensure you've covered all the preparation bases before you get started. So, we've shared our top tips on everything from restoring old plaster and stripping wallpaper to our pick of the best paintbrushes and rollers. For more advice and inspiration, take a look at our decorating hub page. Before going to town with paints and wallpapers in a period property, you'll want to ensure original plaster finishes are in a fit state to be decorated. Unlike modern materials, old plaster tends to have a textural undulating quality that's flexible and allows the wall to breathe. You'll want to look out for cracks, bulges and loose plaster, as well as saggy ceilings, damp patches and areas where plaster sounds hollow when tapped. Should you notice any of these signs, it's important to act before proceeding with later stages of decorating. While plasterwork is easily repaired and may look simple to an experienced DIYer, in reality it requires a lot of skill and as such it's always best to call in a plasterer who has plenty of experience dealing with old buildings. Use our guide on how to repair plaster for more expert advice. We'd recommend using Checkatrade to find a reputable local plasterer who specialises in old plaster. In some cases it may not be possible to repair old plasterwork, or you may be dealing with a new-build or extension which requires fresh plaster in preparation for further decoration. While plastering may seem like a simple task that experienced DIYers may be tempted to take on, it's worth investing in a professional who can complete the task for you as good quality plasterwork will last for years and makes all the difference in terms of the overall finish of your space. When it comes to sourcing reputable plasterers, we'd recommend taking a look on Checkatrade. When it comes to plaster, try Wickesor B&Q. For painting on fresh plaster, there are a few tips and tricks that are worth bearing in mind. Our guide to how to paint on new plaster will help you get it right, first time. Similarly to original plaster, you'll want to think about restoring any original plaster mouldings – this includes cornicing, ceiling roses, skirting, dado and picture rails – before you begin painting them, particularly as they're often smothered in layers of paint build-up. Requiring little more, in terms of equipment, than a paint stripper and scraper, this is a DIY job that requires a little effort, but will make the biggest of differences to the overall finish of your newly decorated room. Our guide to how to strip and repaint original plaster mouldings talks you through the process step-by-step. Alternatively, if your plaster mouldings are non-existent, beyond salvation or not in keeping with your interiors style, you may be required to replace them with new models. Georgian mouldings vary considerably, though popular styles include deep wall friezes, ribbons, swags, classical figures and urns. Other decorative devices include dentils and egg and dart patterns, which are most commonly found in hallways and living rooms. Fibrous plaster allowed for large, complex cornices in Victorian properties. It tended to be ornate, featuring flowers, fruit and vines. Ceiling roses were also popular options. In properties built post WW1, decorative plasterwork disappeared somewhat in exchange for simpler options – think clean lined cornicing and a matching centrepiece. When it comes to art deco properties, it's characteristic to find bold, chunky designs and decorative mouldings. Strong, steeped designs feature heavily, along with solid curves. When it comes to sourcing plaster mouldings, we'd recommend Plaster Mouldings Direct, Victorian Cornice Company, Simply Mouldings, The London Cornice Company and Artisan Plaster Craft. Before you can begin painting woodwork and the like, you'll need to remove any existing paint to ensure a good quality finish. While this can be as simple as using a manual scraper and a bottle of white spirit, you may wish to invest in something a little more technical if you've got a lot of ground to cover and are concerned about inhaling fumes. Whether you prefer a high-powered heat gun or the paste and scraper route, we’ve brought together the best paint strippers on the market in our specialist guide. Amongst our favourites are the DeWalt 1800W Heat Gun, which is a lightweight and compact chemical-free solution, or the Rustins Strypit Paint and Varnish Stripper if you're looking for a more traditional, chemical paint stripper. Alternatively, if you're dealing with stubborn varnish, the Polycell Maximum Strength Paint Stripper could be the one for you. Looking for tips on how to strip paint from a wood door? You'll find everything you need to know in our specialist guide. In order to achieve a high quality paint job, you'll need the correct tools. While paint brushes are perfect for covering small areas, cutting in and achieving a smart finish around the edges, generally a roller is the easiest option for achieving a smart and even finish. When painting interior walls, it’s best to opt for a set of rollers in different sizes, as this will allow for greater versatility and for a smooth finish, even in the tightest of corners. On the other hand, if you are painting furniture, then smaller rollers will allow you to get into the nooks and crannies while maintaining a smooth coat. Most rollers will come with paint trays, but not all, so factor that in if you need one. For most DIY tasks, a standard pile length is medium should do the job, though you may prefer to opt for a longer pile on textured or larger surface areas. To more tips and to ensure you pick the best option for your paint job, view our full guide to best paint rollers for smooth and easy application. In terms of recommended rollers, you can't go wrong with the Harris Really Big Box Set, which is available from Amazon, or the Hamilton Performance Masonry Kit from B&Q. Those new to DIY may be surprised to learn that different types of brushes are intended for use with different types of paint. For example, water-based paints require a paintbrush with synthetic bristles, while solvent-based paint is better applied with a natural bristle brush. Similarly, you'll require different brushes to complete different jobs. It's advisable to use an angled brush for small details, such as window frames and sills. Also bear in mind that natural bristles take some time to break in, so if you're buying brushes for a single job, or for use infrequently, you may be better off buying a synthetic option. In terms of our pick of the best paintbrushes, it doesn't get much better than the Wooster Silver Tip Paintbrushes, which are available from Amazon. Want to consider all your options before buying paintbrushes? Our guide to the best paintbrushes is a handy read. Use these guides below, too, to ensure you're approaching the jobs in the right way. Before you can being painting or papering, you'll need to get rid of any existing wallpaper. Your options for removal include using warm, soapy water and a sponge (definitely the trickiest option on layers of wallpaper); a chemical stripping solution or an electric steam wallpaper stripper – the size and number of layers of wallpaper will determine which option is best. Chemical stripping solutions actively dissolve adhesive in order to release the wallpaper, making the job easier for you. Solutions are generally the bets option if you're dealing with just one or two layers of paper, or if you're removing wallpaper from a small area, such as a feature wall. A steam stripper (as the name might suggest) uses steam to penetrate wallpaper, loosening old adhesive and moistening the paper enough to easily remove it from the wall. They tend to be better for larger areas and are particularly useful if you're dealing with stubborn wallpaper or woodchip. If you for-see yourself removing lots of wallpaper in future, steam strippers are an option worth investing in. If you're looking for a chemical wallpaper stripper, the Polycell Wallpaper Stripper comes highly recommended; while the Performance Power Wallpaper Stripper is a great option if you've decided steam stripping is the way forward. Find both at B&Q. Whether you're looking to give original wooden floorboards a new lease of life; have opted to install reclaimed floorboards or want to prepare stairs, banisters, furniture or kitchen cabinets for decorating, you'll need to get your hands on wood-sanding materials. The equipment you require will vary depending on the surface and materials you're working with. We'd recommend starting with the finest grit possible, based on the condition of the wood. This said, for rough boards it's advisable to start with a coarse grit and work your way through four or five grades – from 24 to 40, 60 and 80 up to 120 grit, or it will take forever. In the case of previously sanded boards, start with a 60 or 80 grit. If you're looking for a sandpaper that you can use by hand, with a block or clip fixing machine, we'd recommend the Norton Expert Grit Sandpaper, which is available from B&Q. If you're looking for a good quality, affordable sanding belt for sanding machine, the PTX Sanding Belt, also from B&Q, comes highly recommended. Remember, you'll likely need more than one type of sandpaper, so opt for a variety of options with different grits. Our guide to how to sand floorboards might be a handy read for you, too, if it's floorboards that you're tackling. Before you embark on your interior decorating journey, you'll want to ensure that you have all your decorating essentials at hand, as there's nothing worse than getting started, then realising you're missing vital components. You may have some of these essentials lying around, but if not they can all be picked up relatively inexpensively from some of our favourite DIY superstores, including B&Q, Wickes, Amazon, Tooled Up and UK Tool Centre. Hallways are high traffic areas that require thought if you intend for them to stand the test of time. From scuff and stain resistant paints and papers to design tips you might consider for a lighter, brighter and more inviting space, this is a section worth reading if you're planning on decorating your hallway. Our guide to how to design a hallway is a must-read read, whatever stage of the process you're at. Paint used in the hallway needs to be wipeable and able to withstand heavy traffic. After all, how many times have you used your hallway wall as a leaning post to take your shoes off? Or watched the kids trail their hands along the walls as they come down the stairs? The Dulux Easycare range is hard to beat, due to the fact that it's not only washable, but scrubbable and therefore the perfect option if you anticipate having to tackle to the sticky finger marks that kids just love to leave all over the walls, at some point or another. It actively repels liquid stains, too. If scuffs and stains aren't too much of a concern, but getting an authentic period finish is, Farrow & Ball's Matt Estate Emulsion Paint makes for a great option, too. Browse our pick of the best paint for hallways if you're in need of more recommended options. You'll find plenty of design inspiration in our paint colour schemes for hallways, too. If you're intent on achieving a smart finish, you'll want to paint your skirting boards, banister and spindles, too. Painting woodwork is a quick and easy task that will make all the difference to the finished look of the hallway. Dulux Trade Interior Pure Brilliant White Satinwood & Metal Paint is durable and long lasting, making it the perfect option for skirting boards and other woodwork in high-traffic areas. If you're still considering your options, browse our guide to the best paint for wood. While you might not immediately think to paint your floor, it's an option worth considering if you're decorating a hallway with tiles or wooden floorboards. If you're tackling outdated or tired looking tiles, you'll need to use a specialist tile paint – we recommend the Ronseal Tile Paint or the Dulux Tile Paint. In terms of design, you can go for a straight-forward, one-tone tile, or achieve an on-trend patterned finish with the help of stencils. This Modern Geometric Tile Stencil from Etsy is our top pick. You can find step-by-step instructions to how to paint tiles in our handy guide. Alternatively, you may be dealing with wooden floorboards or stairs in need of a layer of paint. This is an quick solution, as long as you prepare well, choose the correct materials and opt for a specific flooring paint. When painting floorboards, you will need to begin by sanding your boards in order to prep them – you can read all about that in our interior preparation section, above. You can choose from a range of colours and designs to achieve your desired look – our guide to how to paint floorboards will talk you through the steps. Similarly, our guide to how to paint your stairs is a handy read. In terms of sourcing a high-quality floor paint, we'd recommend the Dulux Trade High Performance Floor Paint. Whether you're looking to ensure a traditional column radiator makes a statement or you'd prefer a slightly less visually appealing radiator to blend into your scheme, this is easily achieved with paint. You'll want to start by ensuring the radiator is cool before getting started with the painting. Lightly rub down then use a small brush and tackle the edges first, working your way inwards. Ensure plenty of overlap in each section to ensure an even finish. In terms of sourcing a suitable radiator paint, remember that you'll need something that's suitable for metal. A great example is Ronseal One Coat Radiator Paint. Wallpaper is another option worth considering in the hallway and is an easy means of adding warmth and interest to a space, while creating a transition between the entrance to your home and the rest of the house. Opting for a patterned paper is an easy way to create a statement in a space, with pattern also renowned for its ability to disguise dirt (or grubby finger prints) if you opt for something busy or in darker shades. For ideas and inspiration, browse our stunning hallway wallpaper ideas. If you've opted to stain wood or leave it in its raw state, it's a good idea to consider wood sealant, which will not only give a smooth even surface that's helpful when adding varnish. Wood sealant can also protect wood stain from bleeding. A simple step that it may be tempting to skip, taking the time to use a wood sealant on your exposed wood – be that flooring, stairs, banisters, spindles or anything else, will make all the difference in the overall finish and longevity of your wood. As previously mentioned, good quality materials that stand up to heavy traffic are essential when designing a hallway and this is arguably most important when it comes to choosing hallway flooring. Tiles are a popular option for many different types of home and can be found in a variety of styles and designs, depending on your taste. When it comes to choosing a type of tile, consider that, while real stone floor tiles may look stunning, not all will fit the requirements of a hallway, so it's important to discuss the specifics when sourcing a material. Ceramic tiles are hard wearing and easy to maintain, while porcelain tiles are similarly durable. Alternatively, you may not wish to replace your tiles, but rather restore them. This is an option that's particularly worth considering if you're dealing with encaustic floor tiles. Read our guides to how to choose real stone floor tiles and how to choose ceramic and porcelain floor tiles, for more information. Durable and with a lasting style, wood flooring is another popular option for a hallway. Whether in a dark tone to disguise dirt or in a slightly more high maintenance, but space enhancing light shade, it's a stylish, yet practical, option for your home. It may also be possible to source reclaimed wood, if that's more your style. If you're looking for a durable, long lasting and realistic alternative to solid wood, engineered wood might be the option for you. What's more, it can be repaired easily, should it become damaged. Kitchens, like bathrooms, require a little more thought when decorating, particularly if they're to stand the test of time. Exposure to heat and water can quickly ruin traditional painted walls, which is where specialist formulas, tiles, splashbacks and other design solutions will come into play. Whether you're planning a complete kitchen refit or are looking for a few easy tips and tricks to update a tired looking space, you're sure to find something that suits in this section of our decorating essentials. Don't miss our ultimate guide to planning, designing and furnishing a kitchen, too. When painting a kitchen, you'll need to opt for something that stands up to rigorous use and is perhaps even stain or water resistant and wipeable (for obvious reasons). If you're working with a larger space where not every wall is in close contact to the hob or sink, something-wipe clean will suffice. However, in the case of a smaller kitchen, you might also think about finding something that's engineered to resist heat and moisture, as well as staining. Our top choice is the Dulux Easycare Kitchen Matt Emulsion Paint, which is easy to apply and dries to a practical, wipe-clean finish. Available in a range of colours, you're sure to find something that suits your interiors taste. Not sure what your dream shade is yet? Our kitchen paint ideas are a great source of inspiration. If you'd like to consider your options when it comes to paint brands, you'll find our guide to the best paint for kitchens a handy read, too. Perfect for an easy kitchen update, painting your kitchen cabinets can transform the look and feel of a space for a fraction of the cost of a complete refit. So, whether you're keen to try incorporating an interiors trend into your space without too much financial commitment, want to achieve a bespoke look on a budget or simply want to give your space a fresh feel, this could be the easiest way to achieve your desired finish. Practically speaking, painting kitchen cabinets is easier than you might think, too, and particularly if you use our step-by-step guide to how to paint kitchen cabinets. In terms of sourcing a good quality kitchen cabinet paint, the Dulux Quick Dry Mid Sheen Satinwood Paint, available from The Range, is our top pick, though you'll find lots more options for your consideration in our guide to the best paint for kitchen cabinets. If you've grown tired of the current look and finish of your kitchen tiles, or have inherited a questionable space from a previous owner, don't lose hope, as painting your kitchen tiles is both quick and easy. You'll need to use a specialist tile paint in order to achieve a smart, non streaky finish – we recommend the Ronseal Tile Paint or the Dulux Tile Paint. In terms of design, you can go for a straight-forward, one-tone tile, or achieve an on-trend patterned finish with the help of stencils. This Modern Geometric Tile Stencil from Etsy is our top pick. It was designed for floors, but with a bit of patience we're sure it could work just as well for wall tiles, too. A popular (and very Pinterest-worthy) addition to a kitchen, chalkboards can function as either a striking focal point if you're artistic or a practical space for keeping track of shopping and to do lists. Available in the traditional black, as well as a range of other colours, chalkboards add a stylish feel to a space, while ensuring it still feels lived in. Our favourite chalkboard paints? The Rust-Oleum Black Matt Chalkboard Paint and the Benjamin Moore Chalkboard Paint, which is available in a staggering 3,500 shades. Browse our guide to how to create a chalkboard wall for more ideas and information. While you might consider hanging wallpaper in the kitchen an unusual move, it's a hot trend that will super-charge your kitchen's design credentials if thoroughly thought through. It's an easy and affordable – depending on your choice of paper – option that will instantly add interest to your space. One thing to consider, however, is how you will protect your wallpaper if you don't opt for a wipeable design that's created with kitchens and bathrooms in mind. Protecting your paper with a glass splashback or only hanging it in areas where it won't be exposed to heat and water are probably your best bets. In terms of design, floral prints in pastel shades tend to be popular options for kitchens with a Shaker or country-inspired or vintage feel, while dark toned papers suit kitchens with more of a rustic or industrial feel. There are no hard and fast rules, however, so it's up to you to choose something that suits your taste and the style of your kitchen. If you're decorating a small kitchen and are concerned about heat or moisture or want an easily wipeable solution for your kitchen, you really can't go wrong with tiles. They'll protect working areas, such as behind the hob and sink, ensuring the wall doesn't get damaged. It's possible to choose between natural stone and manmade tiles, depending on your taste and budget. The main difference being that manmade tiles are, generally, more affordable, available in a variety of colours, patterns and finishes and easier to look after, while natural stone is a little more expensive, but promises a unique beauty. Similarly to tiles, splashbacks are designed to protect kitchen walls from heat and moisture, but are often a little more targeted in their approach to doing so. It's also possible, if you're a handy DIYer, to tile your own splashback, which will save you some money. Our guide to how to tile a splashback talks you through the process, step-by-step. There are a real variety of materials on offer, dependant on your taste and budget. Tiles and laminate are both relatively affordable and easy to maintain, as is stainless steel if you're looking to create a slightly more industrial feel in your kitchen. Alternatively, you might opt for glass if you're looking for something that will protect your walls without affecting the overall design of your space, or stone if you're looking to make a statement. For unusual options include mirrored glass and metallics, which can enhance the design of a contemporary space. Browse our kitchen splashback ideas for more inspiration. Perfect for creating a stylish, yet understated, feature wall, exposed brick has long been considered the holy grail of interiors. If you're lucky, stripping away a drywall may mean revealing a gorgeous, original brick wall that lends itself to your interiors style. If you're opting to expose a brick wall, this should be considered early on in the decorating process, as doing so will significantly impact the way the rest of the decorating process proceeds. Our comprehensive guide to exposed brick walls talks you through the the process of deciding whether or not your space is suitable for an exposed brick wall, before sharing practical advice on how to actually do it. If you're not confident about exposing a brick wall yourself, we'd recommend using Checkatrade to find local tradesmen who will be able to help you achieve your desired finish. Alternatively, if you decide a real exposed brick wall isn't worth the hassle, take a look at the following retailers for exposed-brick inspired tiles and wallpapers. When it comes to choosing kitchen flooring, you'll want to find something that's durable and moisture-resistant if you're looking to minimise hassle and maximise the lifespan of your newly decorated kitchen. It also needs to be able to withstand regular cleaning, potential stains, spillages and fluctuations in temperature. Popular options include tiles, wood and laminate, though there are a few there options available if none of these suit. But what are the pros and cons of each? Durable and available in a range of styles, tiles are the go-to option for many when designing a kitchen. They come in a range of natural and manmade materials and finishes, from textured to matt to high shine. Some tiles are more porous than others, though, so be careful to choose an option that suits your requirements. Slate or granite are recommended, if you're looking for a real stone solution, while porcelain and ceramic offer the solutions if you'd prefer something manmade. Limestone tends to scratch easily, making it an option worth avoiding. For more advice, read our guide to how to choose floor tiles. Alternatively, take a look at our guide to how to choose real stone floor tiles if you're looking to use natural stone. Adding warmth and texture to a space, wood flooring is another popular option for a kitchen. We'd recommend opting for an engineered wood, which comes with a durable top layer that's much more resistant to warping and movement than solid wood. Find out more in our guide to how to choose the best engineered wood flooring. Cost-effective and easy to maintain, laminate flooring is another option worth considering for the kitchen. It's stain and scratch resistant, meaning it's likely to last and is available in a variety of wood and stone inspired finishes. It's always recommendable to buy the best quality laminate you can afford, however, as this will ensure a smarter finish with less shine and is less likely to warp, stain or peel. Offering an alternative to tiles, wood and laminate, materials such as vinyl, rubber and bamboo make great alternatives when it comes to kitchen flooring, thanks to their hard-wearing and water-resistant properties, as well as their affordability. As well as making a space feel warm and lived in, wooden worktops are robust, which makes them a popular choice for a variety of different kitchen styles. However, because they are made of natural material, regular maintenance and careful cleaning is required to ensure they remain in the best condition possible. The state of your worktops will determine the treatment they require. If you're revamping a wooden worktop that's become cracked or has holes here and there, you may wish to start by using a woodfiller to strengthen it, fill holes and improve the overall appearance. Our top choice is the Ronseal Wood Filler, which offers tough repairs, but is flexible enough to cope with the changing state of wood. Sanding your worktop can also help to refresh its finished look – you'll find all the information you need for completing this DIY task in our interior preparation section, along with our pick of the best sanding machines. The final stage of a revamp – or installation if you're dealing with a brand new wooden worktop – is treating the surface with wood oil. This will seal the surface, making it suitable day-to-day use and less susceptible to damage. We'd recommend the Colron Clear Danish Oil , which should be reapplied every eight weeks. You'll find everything you need to know about how to clean and maintain wooden worktops in our specialist guide. The living room tends to be one of the most lived-in spaces in a house (hence the name) meaning it's usually top of the priority list when it comes to decorating. Whether you're looking to refresh your space quickly and effectively with a coat of paint or a new wallpaper, or are going all out with a complete change in interiors style, you'll find plenty of handy help, advice and inspiration in this section of the decorating guide. We've packed it full of recommended retailers, too. Looking for more advice? You'll find out guide to how to design a living room a handy read. Unlike in the kitchen, living room walls are much less likely to come into contact with water, so there's less need for such a specialist paint formula – paint brands like Dulux or Crown are our favourite go-tos for quality and finish. Other brands to try include Valspar and, of course, the perennially fashionable Farrow & Ball and Little Greene, although these paints are more expensive than the DIY stalwarts. As for colour, if you're not sure where to start, we have plenty of ideas and inspiration in our guide to the best paint colours for living rooms. Ideas include dark shades for those who can't get enough of the moody interiors trend, orangey hues inspired by Pantone's Colour Of The Year and bright whites and pastel shades for those who are looking for a space enhancing option. Alternatively, if you're decorating a period property and want to achieve an authentic look, you might consider taking a little time to effectively research the history of your home and interiors styles that were popular at the time. Alternatively, as is popular with many restoration so period properties, you might consider opting for a variety of versatile neutral and tonal shades, such as whites, creams, greys and taupes, which provide the perfect backdrop for changing interiors' tastes. There’s no shortage of paints available, whether you're looking to replicate historic shades and ingredients, or reap the benefits of modern-day formulas, on-trend hues and colour-matching solutions. Use our guide to how to choose paint to decorate a period home for more insight into choosing the correct colour palette for a period home. For guidance on picking the right tones and colours to suit a room's orientation and size, see our guide to picking the right paint colours for every room in your home. Then, once you've gathered together some ideas, consider the following brands for paints that are perfect for period renovations. Wallpaper is another option worth considering for those looking to transform their living room quickly and – if you source the right paper – relatively inexpensively. From rustic looking brick-effect wallpapers to bold prints perfect for a feature wall, you're guaranteed to find something that suits the style of your home as well as your interiors taste. Need inspiration? Our statement living room wallpapers design guide is a great starting point. We've put together lots of other gorgeous design guides, which might help you find the wallpaper of your dreams, too. If you're wondering about our go-to wallpaper brands, we're happy to recommend Little Greene, Graham & Brown, John Lewis & Partners, GP & J Baker, House of Hackney and Wallpaper Direct; MuralsWallpaper are a must if you're looking for a gorgeous mural, too. Find more wallpaper designs on our dedicated hub page. And, once you've made your all important choice, check out our step-by-step guide to hanging wallpaper. For anyone's who's missed it, the ombre paint effect is where one tone gradually fades into another tone of the same colour, creating a big visual impact. Despite its striking appearance, an ombre paint effect is actually relatively easy to achieve with little more than a few cans of paint. Our guide to how to paint an ombre accent wall will talk you through, step-by-step. There's plenty of inspiration in our awesome ombre paint effect ideas, too. While ombre is all about a subtle, tonal transition, colour blocking (see below) intends to make a statement; characteristically pairing two or three totally different colours to make a bold statement. You'll find plenty of inspiration in our colour block paint ideas design guide. As mentioned previously, our favourite paint brands include Dulux, Crown, Valspar, Farrow & Ball and Little Greene. Remember, to achieve either and ombre or colour blocking effect, you'll need to choose more than one shade of paint to use in combination. An easy way to update tired looking furniture is by giving it a fresh coat of paint. So, whether you're faced with a tired-looking sideboard, bookshelf, coffee table or wooden chair, carefully consider whether a fresh coat might be its salvation, before opting to buy new. It's also possible to apply some of the paint effects discussed above to a piece of furniture. Ombre chair, anyone? With the Chalk Paint from Annie Sloane, it couldn't be easier. You can achieve equally stylish effects with the Chalky Finish Furniture Paint from Rust-Oleum. Interested? Our guide to how to paint furniture talks you through the process step-by-step. Limewashing doors, floorboards and other oak furniture is a popular technique for those who love the white-washed effect that can be achieved with wood and can be a saviour if you've stripped back your flooring in hope of finding gorgeous, original features, only to be left disappointed. If you do opt to limewash any aspect of your woodwork, we'd recommend using the Colron Clear Liming Wax, available from B&Q. For more advice on how to lime wood and our full list of essentials to get the job done, take a look at our specialist guide. As a space that's commonly used to greet and entertain guests, living rooms demand something smart underfoot, as well as striking the right note for relaxed everyday living. Popular choices for the living room, carpet and natural flooring, which are soft underfoot and if an 80 per cent wool is chosen in the case of carpet, or a material such as sisal in the case of natural flooring, are hard-wearing enough for the expected amount of traffic. Our guides to choosing a carpet and how to choose natural flooring are handy reads if either of these sound like the solution for you. Carpertright, Sisal & Seagrass, Elements London and Brockway Carpets are great starting points for sourcing carpet and natural flooring, too. While carpet is a popular option in the UK, it's a controversial material, with many people possessing a rooted hatred of it. In that instance, hard flooring makes for a great alternative, particularly when paired with a rug which can soften the space. Options include vinyl or laminate flooring, both of which can pull off the look of natural materials without the same cost. Alternatively, solid and engineered wood, and natural stone are enduringly beautiful. Concrete and resin can work well in contemporary spaces, too. Recommended retailers include Broadleaf, UK Flooring Direct, Ted Todd, Junckers, Carpetright, Fired Earth, Beswick Stone and The Natural Wood Floor Company. Still haven't decided which type of flooring will suit the size, style and design of your room? Our guide to how to choose living room flooring was designed with you in mind. Though there's some crossover with the designs and materials recommended for the living room, the bedroom does allow for a little more focus on luxury and a little less focus on having to be a hardwearing, durable space. Though this is, for obvious reasons, slightly less of the case when it comes to kids' bedrooms. With this in mind, this sections talks you through the paints, papers and flooring that can work effectively in both adult and kids' bedrooms. You'll find more practical advice in our guides to how to design a bedroom and how to design a kid's room. Expecting a new baby? Don't miss our guide on how to design a nursery, too. Decorating with paint is the easiest way to update a bedroom and can be completed in a relatively short period of time, but you'll need to take a little time considering your scheme before getting started. You should begin by thinking about the mood you're looking to create in your space; will it be bright and cheerful, cosy and muted or something more standout? Your scheme may also be influenced by the style of your property: are you working with a bedroom in a period property, or designing a completely contemporary space? It's also important to consider how much sunlight your bedroom gets. If it's north facing you may consider opting for a design that will brighten your space, as opposed to opting for dark shades. Similarly, you'll want to think about how your shade will look in both natural daylight and under lamplight. Our modern bedroom paint ideas provide plenty of inspiration if you don't know where to start when it comes to choosing a paint scheme for your space. Similar principles apply when choosing paint for kid's rooms, though you may consider opting for a wipe clean paint if you're concerned about fingerprints ruining the paintwork. You should also bear in mind that children's interests change quite quickly, so opting for bright and bold shades could mean redecorating sooner than you'd hoped. You'll find plenty of inspiration in our paint colour schemes for kids' bedrooms design guide, and find plenty of nursery design ideas in our gallery, too. Wallpaper and murals make it easy to incorporate pattern, interest and texture into a bedroom, either covering all walls or creating a striking feature wall. You can afford to opt for something a little more delicate in the bedroom, as the paper is unlikely to come into contact with water or heat which can cause damage. Whether your taste is for modern murals or on-trend botanicals, traditional florals or quirky prints, you'll find plenty of inspiration with our bedroom wallpaper design ideas. Perfect if you're a renter, are looking to incorporate a trend into your space or want to be able to quickly alter the design of a kids' room as their interests change, wall stickers can be removed from a wall as quickly as they're pasted. Depending on your taste and budget, options range from customisable stickers to budget-friendly, on-trend styles for your inspiration. Carpet is arguably the most popular choice thanks to its warm and soft feeling underfoot. While it's, of course, possible to opt for the same light or hardwearing carpet you might have fitted throughout your home, if you're tempted by a luxurious, deep pile carpet, the bedroom is probably the place to do it. Saxony carpets not only have that sink-your-feet-in feel, but also produce attractive light and shade effects as the pile is brushed in different directions. While most rooms throughout the home are better suited to a wool blend carpet, it's possible to opt for a pure wool carpet in the bedroom. Similarly, it's possible to opt for light shades if you intend on having a strict no-shoes policy in the bedroom. You'll find plenty more handy advice and information in our guide to choosing a carpet. With similar properties to carpet, natural flooring is another popular options for bedrooms that can add striking texture to a space. Sisal and seagrass are likely to best suit the requirements of a bedroom, especially as coil can feel a little uncomfortable underfoot. Find out more in our guide to how to choose a natural flooring. Carpet is somewhat divisive, with hard flooring proving a popular option for those who can't stand the thought of it. It can work particularly effectively in a contemporary space when paired with rugs or runners for a cosier feel. Popular options include wood, engineered wood or laminate, all of which are discussed in greater detail up in our kitchen flooring section. The same principles apply, though heat and moisture resistance are less of a priority in the bedroom that they would be in the kitchen (or bathroom). Browse our guides to how to choose the best laminate flooring, how to choose the best wood flooring and how to choose the best engineered wood flooring for more expert advice and information. If you still haven't decided which type of flooring will best suit your bedroom, our guide to how to choose the best bedroom flooring provides plenty of expert advice and inspiration. It's more than possible to decorate a bathroom without having to undertake a complete refit. From changing the feel of your space with a fresh layer of paint to creating a feature wall with a bathroom-ready wallpaper, changing the feel of your space can be easy and affordable. From stylish bathroom design ideas to our pick of the best recommended retailers, this section cover everything you need when decorating a bathroom. You'll find plenty more advice and inspiration in our guide to how to design a bathroom. Similarly to in the kitchen, when it comes to painting a bathroom you'll need to think about more than choosing a colour that suits your interiors style. Bathroom paints need to be moisture and mildew resistant, contain the right ingredients and the necessary properties to handle the damp environment, and they may even need to be wipeable, particularly if you have young children or a dog that gets the occasional bath in there, too. On top of this, it's preferable to opt for a soft sheen finish, which will bounce light around the space, making it feel lighter, brighter and larger, a characteristic which is particularly useful in small bathrooms. When it comes to choosing a shade, bear the following factors in mind. Light colours will (obviously) make a space feel lighter and more spacious, but there's no reason why you shouldn't opt for an on-trend, inky shade if your bathroom is flooded with natural light, provided you ensure artificial lighting is good enough to keep the room well-lit at night. Our top recommendation for bathroom paints is the Dulux Easycare Bathroom Paint, available from Amazon, which protects against mould for up to five years and is available in a variety of shades. Browse more recommendations in our pick of the best bathroom paints. If you have an old cast iron bath, it's possible to give it a style refresh with a new coat of paint, as opposed to having to replace it. If your bath is made from a material that isn't cast iron, painting it is not advisable. This can be completed on a DIY basis, but you'll get a better result using services such as BC Design's Bath Painting Service, which will ensure a professional looking finish. If you're confident about painting your bath on a DIY basis, you should start by researching which type of bath paint your bath manufacturer specifically recommends. While wallpaper might not be the most obvious option for a small bathroom, where, even if it comes it doesn't come into direct contact with water, it may quickly become damaged by water vapour, it can be used in larger, well ventilated spaces, as well as in downstairs toilets. Speaking of downstairs toilets – using an intricate or bold repeat pattern wallpaper can make a striking design impact in a small downstairs loo. When choosing a wallpaper, it's generally recommended to opt for something that's hardwearing and water resistant. Use tiles to protect your walls in any spaces that could come into contact with water, it's definitely better not to take the risk. If you're looking to change a little more in your bathroom than just the paint or style of paper, you might consider replacing your wall tiles, as doing so can completely transform the look and feel of your space. With natural stone, ceramic, porcelain and glass, plus a multitude of shapes and finishes all on offer, you're sure to find something that suits both your budget and your taste. Natural stone is one of the most popular options, thanks to its character and unique finish, though it's worth noting that the stone will require higher levels of care and the tiles will need resealing relatively regularly. Generally, manmade stones make for a more budget-friendly alternative, though their finish will not be as unique. You'll also need to think about the finish of your tiles. Would a gloss finish, which will reflect light around the space and make it feel larger, suit your bathroom? Or might a matt finish, which doesn't reveal water marks, better suit your needs. You'll find a much more comprehensive guide to choosing a tile size, style and design that suits your bathroom in our guide to how to choose bathroom tiles. It's important, when choosing flooring for a bathroom, to opt for something that's equipped to withstand water, as well as water vapour, without getting damaged. Durable and available in a range of styles, tiles are the go-to option for many. They come in a range of natural and manmade materials and finishes, from textured to matt to high shine. Marble and travertine are popular if you're looking for a natural option, but pick polished varieties, as both these materials are naturally porous; quartz tiles are a great manmade choice for bathrooms and typically come in a highly polished finish; porcelain and ceramic are can't go wrong options, too. Adding warmth and texture to a space, wood flooring is another popular option for a bathroom. We'd recommend opting for an engineered wood, which comes with a durable top layer that's much more resistant to warping and movement than solid wood. Check with the manufacturer that it's suitable for bathrooms before committing to a purchase, however. Read more in our guide to how to choose the best engineered wood flooring. Cost-effective and easy to maintain, laminate flooring is another option worth considering for the bathroom. It's stain and scratch resistant, meaning it's likely to last and is available in a variety of wood and stone inspired finishes. Offering an alternative to tiles, wood and laminate, materials such as vinyl and rubber make great flooring alternatives in the bathroom. They are affordable, hard-wearing and water-proof, meaning they stand up to the demands of the bathroom both practically and aesthetically. On top of all of that, new technologies and printing processes mean that alternative flooring can now compete for appearance and quality with other kinds of flooring. Still not sure which flooring will work best for your bathroom? Our guide to how to choose bathroom flooring provides a more in-depth insight into the pros and cons of each material. Looking for more decorating advice and inspiration?